Lesson: Kobe Bryant jumping over a pool of snakes. Real or Fake? I’m no genius when it comes to this teaching thing. It took me 12 years to get from Stage 0 to Stage 4 for this lesson. And I still have plenty of lessons stuck in Stage 0 and Stage 1! This entry was posted in Uncategorized and tagged inquiry, lesson progression, modeling, physics, projectile motion, technology, video. Bookmark the permalink. I really like this post as an example of the “Good is the enemy of great” idea. I’m plenty pleased with myself anytime I can figure out how to move from Stage 0 to Stage 1. I’d think, oh, that’s pretty good. And then stop. You kept going and will keep on going. Nice to be reminded that you are mortal like the rest of us who struggle to get every lesson up to spec. I was beginning to have a serious inferiority complex reading your stuff. Also, if you study the progression above, there are some arguments to be made about the role of technology in improving lessons. It looks like a flow from paper-based textbook stuff to multimedia delivery. Not that every lesson needs video clips, but they sure help with visualization of concepts and sparking interest like the Kobe snake pit video. Jason: I thought that Stage 1 Powerpoint was the bee’s knees when I made it. My physics colleagues were impressed. It was animated and it clearly made the point. But that was the problem. The powerpoint was making the point, not the students. Chris: I see it as a progression towards tech, then away, then towards again. First I moved towards tech was when I thought making flashy Powerpoints would be an improvement. I think this is everyone’s first attraction to tech. But shiny isn’t better. Then I move away from shiny tech to make the students do some cognitive weightlifting on their own. And you can see how the second worksheet is trying to be less helpful than the first (as Dan Meyer would say). Finally there is a move back to tech, but only because it is more pedagogically appropriate than the worksheet. The video analysis technology with Logger Pro and Flip cams allow students to design their own projectile experiments. And that, in turn, allows the class to engage as a scientific community as groups whiteboard their results and share during a board meeting. One more note: I called the first example Stage 0 not because it’s lecture mode — Stage 1 is lecture also. 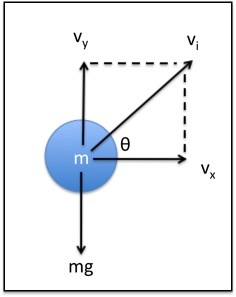 But rather because Stage 0 illustrates teaching from abstract (force diagram) to concrete (resulting parabolic motion). All the other stages start from the concrete (the motion) and will move to the why (analysis of forces). Randy Knight, in his book Five Easy Lessons: Strategies for Successful Physics Teaching, suggests doing this whenever possible, especially since many of our students are transitioning from concrete to formal reasoning.